Ryanair announced 31% cancellations in Belgium on 25-26 July. According to documents seen by La Libre Belgique, it will be 70% in Brussels and 50% in Charleroi. Some passengers will have a big surprise! The unions even hint that not one single Ryanair flight will take off from Belgium on 25-26 July. They probably have forgotten that Ryanair has moved some Polish and German crews to Belgium to operate some flights. they can do whatever it takes to prevent them from doing so ..
Is Ryanair deliberately lying in order to improve its image? This is an outright lie! Many Ryanair customers are still struggling to find suitable alternatives if the solutions suggested by the airline are not acceptable. Ryanair cannot be reached by phone (except rarely on a surcharged number), doesn't answer on Facebook or Twitter. Did a quick check using FR24. As of now, 16:20Z, Brussels has 11 flights listed as Cancelled for tomorrow 25JUL out of 20 flights total. Flightstats.com reports the first flight, FR2961 to MPX, as cancelled (status changed this morning at 05:07Z). The afternoon flight, FR2963 to BCN, is also Cancelled with the status changed today at 15:11Z, about one hour ago. This may hint to further cancelation being in the process to be announced. As for CRL, FR24 reports only one (1) cancelation : FR6902 to Girona with STD 08:50. All the other 56 flights are still scheduled according to FR24. Good luck to all affected. Many Ryanair customers are still struggling to find suitable alternatives if the solutions suggested by the airline are not acceptable. Ryanair cannot be reached by phone (except rarely on a surcharged number), doesn't answer on Facebook or Twitter. Indeed - that's confirmed by many stories in the Flemish press. Ryanair totally disregards the European legislation and local legislation. Not only about the indemnity (250-400-600), but even about the basic rerouting. "At the passenger's convenience", legislation states. But passengers can 't even contact Ryanair to advise them what their "convenience" is. Right to reimbursement or re-routing. I know why I do not fly Ryanair. There are many reasons often shared by others that I fully share! I understand less that the EU does not impose on Ryanair its regulation in the European sky ... and forbids it to fly if this regulation is not observed. Meaning 11 flights are cancelled, and 9 operated (often coming from non-striking bases). The figure of 70% then clearly related to BRU-based aircraft only. A union leader declared to RTBF that 100% of the cabin crew based in Brussels would be on strike. If some flights take off tomorrow they will be manned by crew from foreign bases. Don't forget that Ryanair has been shamed publicly more than once on their stance against the EU-Rule 261/2004. So the passengers should not be surprised that they loose money because Ryanair is not willing to respect basic norms in social negotiations. But no, why should they be blamed for the result of their hunger for low fares. It's easy to blame the other without having in mind what they do themselves. You cannot blame passengers for their hunger for low fares. So you cannot blame passengers, in no way, for this strike. "The passengers" is actually always just one passenger: it's an individual sitting at home, behind his/her computer or laptop or tablet or smartphone. All he/she does, is surf the net, compare fares and then book and pay for it. Passengers -specially the Ryanair ones- are not organized. They don't communicate to each other "let's not book untill Ryanair lowers their fare even more". And they have to accept the fare that Ryanair puts online. The only power an individual passenger has, is not to book. One could eventually blame the travel industry for negociating fares that don't allow airlines to operate with a profit. But that's not the case with Ryanair, who is not active in the open distribution sales circuit (although they have some deals with some brokers indeed). But even then, it's the airlines who decide the fare. This is for Charleroi ! ... I understand less that the EU does not impose on Ryanair its regulation in the European sky ... and forbids it to fly if this regulation is not observed. The European institutions (EU-Commission, EU-Court) can't just simply forbid them to fly. But they can fine them severely, when it's proven that the constantly continously disrespect European legislation (like 261/2004). This takes time however - like the ongoing strike now, which could have been prevented by simply recognizing the trade unions. It will take some months before the EU can confirm that Ryanair voluntary refuses to obey to the EU legislation. What will happen much sooner, is local prosecution: on request of the Belgian minister for Consumer Affairs, the Algemene Directie Economie Inspectie / Direction Générale Inspection Economique will probably sue Ryanair because of easily-to-be-proven infracts against consumer legislation. And though the fines are low, there is also a personal punishment when it's proven that it's voluntary indeed. We're not talking about Euro's then, but about a criminal court case. ... and 60% of the flights cancelled, although the situation in CRL is much less clear than in BRU, where all the cancelled flights were announced in advance. In CRL, most flights are announced as scheduled and appear only to be cancelled later, although the passengers have been informed of those cancellations. 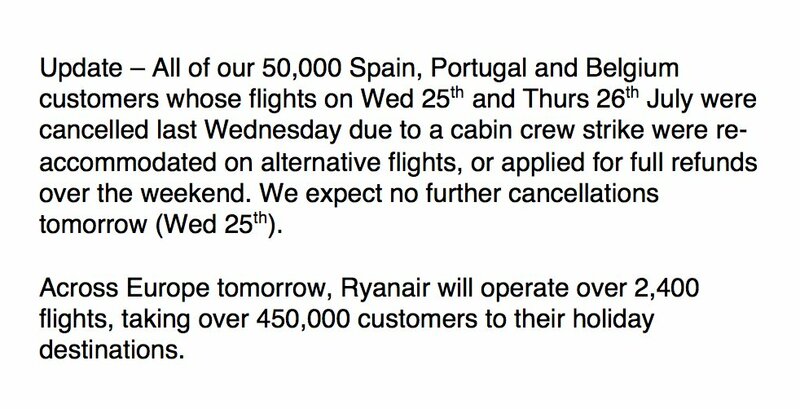 Summary in brief: Ryanair says f*uck you to their clients. Indeed: they didn't find a "Belgian" crew to operate the flight. And when I say Belgian, it only means "based in Belgium", because all of the cabin crew at Brussels are now Romanian, Portuguese, Polish, etc. No Belgian person would accept to work with a salary of €1000 nett with the high costs of living in Brussels. Sorry, not true there is Belgian crew based in BRU and CRL. Further more, the high succes rate of the strike proves my point that Luk De Wilde's article was pure and utter crap based on hearsay.